The featured food on most Thanksgiving tables – the turkey – cost slightly less than last year, coming in at $21.71 for a 16-pound bird. That’s roughly $1.36 per pound, down 3% from last year. The survey results show that retail turkey prices are the lowest since 2014.
a 1-pound veggie tray was $.75. A group of miscellaneous items including coffee and ingredients necessary to prepare the meal (butter, evaporated milk, onions, eggs, sugar, and flour) was also up slightly, to $3.01. a half-pint of whipping cream at $2.08. New this year, American Farm Bureau also checked prices on a 4-pound bone-in ham, 5 pounds of Russet potatoes and 1-pound of frozen green beans. “Adding these foods to the classic Thanksgiving menu increased the overall cost slightly, to $61.72 or about $6 per person,” the survey found. Farm Bureau also surveyed the price of a traditional Thanksgiving meal available from popular food delivery services. This revealed that the convenience of food delivery does have a larger price tag. A 16-pound turkey was nearly 50% more expensive at nearly $2 per pound when purchased from a food delivery service. 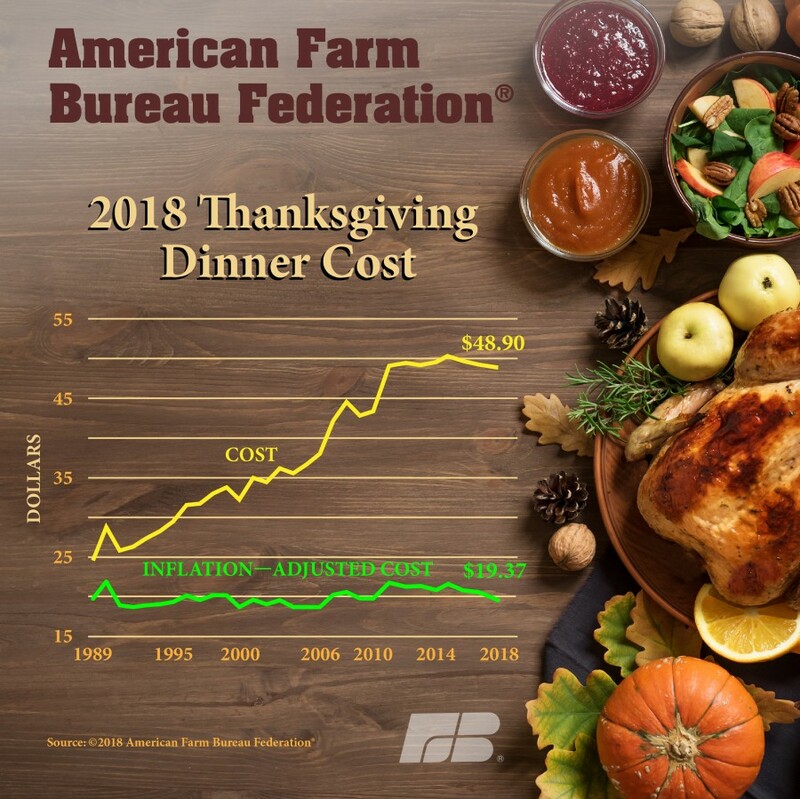 Nearly every individual item was more expensive compared to the Farm Bureau average and the total cost of the dinner was about 60% higher at about $8 per person.